Cloudy and Warm, Water Temperature 84* and Clear. Today was a great day of family fun and fellowship. We had a morning trip today so I got out early enough to put 225 baits in my tanks and picked my crew up at their dock at 5:30. After hitting 6 or 8 different places catching Stripers everywhere we went I looked in my tanks and had only about 30 baits left. It was only 9 o'clock so I located some bait, made one toss and put 150 beautiful more baits in the tanks. Although we had been having a great morning catching fish once I caught these nice baits I knew we were destined for success. We pulled up on the next spot and started banging the Stripers. The fresh baits were working out well then Cory hooked up with his nice Largemouth. We popped a couple quick pics and returned the bass back where we caught it. The Bass came out of 30 foot of water. We looked for awhile hitting a few spots catching fish almost on every stop. It was getting late so I told them we would try one more spot. We hit a shallow flat and that is where Cathy caught her nice Bass. The day started off with a catfish and I told one of the boys that if whoever catches the first catfish kisses it it would bring good luck to the boat. He did and it did. We tore the Stripers up this morning and everyone had a ball. 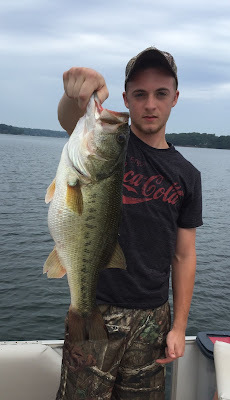 Cory ended up catching the largest Largemouth and Striper as well. The Stripers are Rocking, get out and get you some!